Over this past week, I have been sharing out reflections on my trip to Chicago for the ALA Annual Conference. You can read part I and part II for more pictures and thoughts. 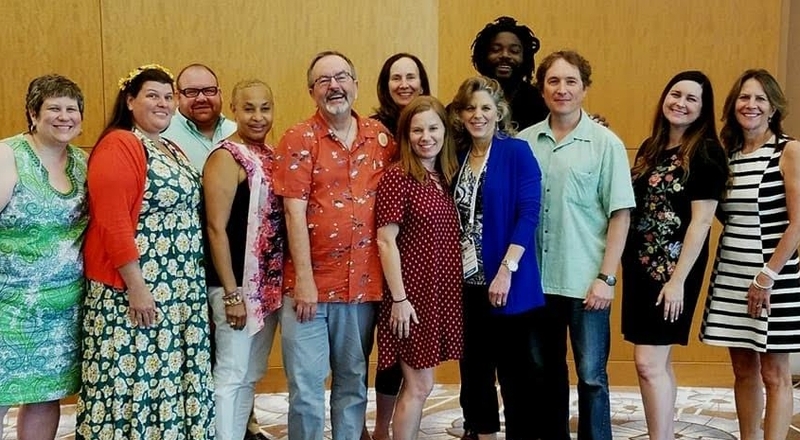 As typical of any ALA conference, connecting with friends, authors, publishers, and other book people is part of the experience. The conversations over meals or while walking around the exhibit hall or en route to an event add a richness to conference experience that is tranformative. Often I fail at taking pictures with those that I meet up with and other times pictures just don't turn out well. Below I have tried to include photos despite their graininess. I haven't included names of everyone because I know I will accidentally leave someone out. Thank you to Ed Spicer, this was my first time at the CSK Award Breakfast, and it certainly won't be my last time. Next year, I plan to get my ticket early. The speeches by each of the winners were heart-felt and moving. The ALSC Awards are held the morning after the Newbery/Caldecott/Wilder banquet. I know I hit snooze quite a few times but I love going to see the awards presented to the Sibert, Batchelder, and Geisel winners even if I can't usually stay for the whole thing. It was also my second time during the weekend that I got to hear Rep. John Lewis speak and I appreciated his inspirational messages. One of the highlights of the conference is attending the Newbery/Caldecott/Wilder banquet. I had so much fun sitting at The Brain Lair (a nod to the bookstore Kathy Burnette plans to open) table with Nerdy Book Club friends. I am always inspired by the speeches given by the winners. Check out this link to Horn Book for the print version of the speeches. Schneider Family Book Awards are given during the ALA Awards. Though we do not have an opportunity for our winners to give an acceptance speech, it is fun to see them walk across the stage with committee members to receive their awards. We do celebrate as a committee with the winners at a luncheon where Dr. Katherine Schneider speaks to everyone via speakerphone. I was particularly terrible at taking pictures at the Schneider Family Book Award Luncheon. However, I had to get a picture of these awesome gifts from Jen Bryant and Boris Kulikov. Each member of the jury received a braille version of Six Dots and a bracelet with braille writing on it. I tried to capture the bracelet in this picture. I tried to get a picture of the braille overlay in the braille version of Six Dots. It is fascinating to see and feel if you have never experienced a braille book. I can't believe that I actually got to hear Hillary Clinton give the closing keynote. I dragged Mary Ann out at 6:00 a.m. so we would be in line early. The good news - we ended up in the fifth row. I included Clinton's speech as recorded by CNN below if you are interested in listening to it. I appreciated her support of literacy and libraries. Though it has been a few days since the end of the conference, I am still extremely thankful that I have been able to attend and be a part of the events of the weekend. I am thankful to all of the ALA staff for the work they put into planning and organizing the conference. I am also thankful for all of the publishers for all of the things they do to help participants connect with authors and books. Now to look forward to NCTE '17 in November. Nonfiction Picture Book Wednesday: #NCTE14 - It's a Wrap! Recently, I arrived back home after spending several days in National Harbor, MD for the National Council of Teachers of English (NCTE) Annual Convention. If you are an elementary teacher and you believe that NCTE is only for High School English Teachers guess again. This was my fourth year attending NCTE and I can confidently say that there are amazing sessions for teachers of students at all grade levels. However, one thing I realized this year is that relationships can make or break the experience for a participant. Early in my career as a teacher, I would at times be sent to a conference. If I was fortunate to be sent as part of the team, the conference seemed to be better than if I went alone. However, when you have worked to develop relationships with those all over the country, the conference is a completely different experience with much more depth. One of the things that made this experience so meaningful were all of the relationships and connections that I have developed over the past several years. Though I could list dozens of people that I loved seeing, hanging out with having a meal with or a special chat. I would be afraid of missing someone. So I have just provided some highlights from the conference. However, friends please know that this experience was more amazing because of the chance to spend it with each of you. The Scientist in the Field Session - Loree Griffin Burns and Elizabeth Rusch shared respectively about their new books Beetle Busters and Next Wave. The session was extremely informative as those who attended were able to learn about the research and back stories to the books that they write. Additionally, I have been wanting to meet both of these authors for quite awhile and finally got a chance to meet them after their presentation. Attending the Panel led by Jeff Anderson which featured Kate Messner, Erin Dionne, Varian Johnson, Sarah Albee, Laurel Snyder, and Linda Urban. The focus was on how to "read like a writer" leading hopefully to writing like one. The focus was on mentor texts, which is an area that I want to learn more about and was excited that I was able to attend. In the evening, I attended a special dinner hosted by Boyds Mills Press to celebrate authors and poets. It was an "once in a lifetime" opportunity. For the first half of the dinner I sat between authors, Eileen Spinelli and Larry Dane Brimner. For the second half of the dinner, I sat between poets, Rebecca Kai Dotlich and Amy Ludwig VanDerwater. For the most part, I sat in awe and needing to pinch myself to believe I was really there. On the second day of NCTE, I was kind of nervous. I think the day is a partial blur. Since I was presenting in the late afternoon, I seemed to have trouble focusing. I attended a session about the Orbis Pictus Award and a special luncheon where I was able to hear Lucy Caulkins speak. Below is a group selfie of Cynthia Alaniz, Lisa Morris-Wilkey, and myself as we wait to get into our room. Our presentation was on nonfiction and ways to support students while using nonfiction in the classroom. In the event that the slideshare doesn't work as an embedded app, here is the link. Finally, in the evening, I had a chance to meet up with Nerdy Book Club friends and of course there was a lot of book talking going on. On the final day of NCTE, I found myself at some wonderful gatherings and then spending some time in the afternoon with a variety of Nerdy Book Club friends. Children's Literature Assembly Breakfast - The guest speaker at the breakfast was Jon Klassen. I love hearing all of the back stories to the books that he writes. Scholastic Brunch - One of the fun sessions is the Scholastic Brunch where authors join in for a form of readers' theater. I am excited about new books from Augusta Scattergood and Pamela Muñoz Ryan. My challenge to you: If you have never attended NCTE, give it a try and sign up to attend in 2015. If you have attended, think about pairing up with others to submit a proposal to present. Hope to see you in Minneapolis, Minnesota next November for #NCTE15.